Remove all cards from the layout by placing them on the open card at the bottom. Only cards with values that are either one higher or one lower than the open card can be placed. Note that the Ace is both a high and a low, and either a 2 or a King can be played on it. Wild Cards can be used at any time on any value and any value can be played on them. Using them will not interrupt the card run and can help you beat your high score. You are given 1 Wild Card per round and can purchase more. However, there is a 1,000 points bonus for every round no Wild Card is used in. If you are out of options, turn over the next card in the deck. The round continues until the deck is out of cards. A 'Take Points' button will appear on screen once all cards are turned over, which will end the game and tally your score when tapped. However, if you manage to clear all cards from the layout you get to the next round, carrying over your score. That's how you build a high score. You can replay the game as many times as you like to get the best score! You score points for each card removed from the layout, runs without turning over cards and clearing peaks. Each card removed from the layout will increase the card run by 1 (²). When you turn over a card from the deck it will reset to zero. The card run score multiplies the points you score each time you remove a card or clear a peak. If you have more than one option, see which may lead to a card run. There is no penalty in using the Undo button. If you have several cards of the same value, see if you can go up and down a few times to build a longer card run. If you can’t find an answer to your question, please don’t hesitate to get in touch! Q: I previously purchased the Upgrade, had to reinstall the game and the Restore Purchase button doesn’t seem to work. A: The problem you describe is sometimes caused when the game and your account are not synced (e.g. this can happen when installing the game on a new device, or after updating the device itself among other things). Please verify that you are logged into iTunes with the account you purchased the Upgrade with and try tapping the ‘Restore Purchases’ button inside the game. If this does not resolve the issue for you, you may need to verify that your account is in fully working order. Apple requires an up-to-date payment method to be active, even when restoring purchases. If possible, trying the restore purchase process on another app is a fast way of testing the account. More information and options can be found here (https://support.apple.com/en-gb/HT204530). 2.) Log into the App Store on your device. 3.) For iPad: Go to the “Purchased” Tab and go onto Step 4, For iPhone: Go to “Updates” then select “Purchased” from top of the menu and go onto Step 4. 4.) Locate the game from the list of apps. 5.) To the right hand side you will see a cloud with an arrow pointing down. 6.) Press the cloud icon to download the latest version of the game again. Once the app has downloaded onto your chosen device. 8.) Scroll to the “Options” menu. 9.) Click on the “Restore Purchases” option from within the menu system. 10.) This should resolve the issue for you. If you have more than option, see which may lead to a card run. Can I switch off the tutorial? From the Main Menu, if you select Options there is a tick box within the option to ‘Show Tutorial’. If you make sure there is no tick in this box, the tutorial will no longer display itself at the start of every game. We are sorry to hear that you are unhappy with the game Upgrade. As advertised, the main feature of the upgrade is the removal of advertisement. As we distribute our games for free, we are dependent on income from either advertisement or a small one-off fee in its stead. As you can imagine, making games like ours takes some time and involves several people, all of who have families. We are strong believers that generosity is an important value to uphold, so in addition to switching off advertisement we always give a few minor enhancement as part of our game upgrades. However, we also believe that the customer should have the choice to enjoy our games in either configuration, so we don’t keep the core of the game experience from anyone. If you are unhappy with our choices in regards to the scope of the Upgrade, please get in touch with Apple directly for a refund. We don’t have access to your account information or have any ability to request a refund from our end. All our games are considered for updates and/or sequels and if you get in touch we will pass on any thoughts you may have to our design team for consideration. How does the scoring work? / What is ‘Score Build Mode’? 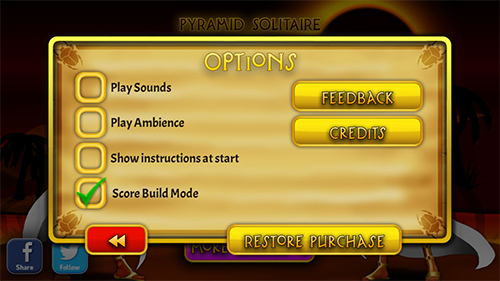 Once the scoreboard is full, players can take advantage of the ‘Score Build Mode’ player aid in the Options Menu (Main Menu > Options). When active, the ‘Score Build Mode’ option carries over your score into the next game, until you have built up a score high enough to displace a score on the table. However, if you scored well enough to make it into the Top 10 the game will score normally. How can I reinstall my game? Removing the application from your device and then re-download it again for free from Apple’s App Store can sometimes resolve technical. Please be aware that you may lose your scores when doing so. Please get in touch with us, if re-installation does not solve the problem you are experiencing. We will do our best to help you resolve any issue you may be facing. The ‘restore purchase’ process works as intended 99.9% of the time, but there are occasional reports of this failing, not only on our games, but on games by other companies as well. Unfortunately we are entirely powerless to do anything about it. The basic principle of how purchases work is that the item you buy has an ID on the system, that is then linked to your Apple account. The ID for the items we sell never changes, so if the link breaks for whatever reason, that doesn’t appear to happen on our end. We’ve analysed our code several times and have not been able to find a technical issue that may lead to these extremely rare occurrences. Further, we don’t have access to purchase data for Apple customers, so we can’t follow the trail of any error and we can’t refund ourselves. Sadly for us – and we are sincere about this – we are not even able to offer you a voucher code, as Apple doesn’t issue these for In-App-Purchases, only for paid products, and all of our games are initially free. As such, the only advice we can give you is to follow Apple’s own help suggestions on the matter ( Apple Support) and if that fails, please get in touch with Apple themselves and ask for a refund. Where are my previously purchased items? Sometimes the game and your account are not synced (e.g. this can happen when installing the game on a new device, or after updating the device itself among other things). If this does not resolve the issue for you, you may need to verify that your account is in fully working order. Apple requires an up-to-date payment method to be active, even when restoring purchases. If possible, trying the restore purchase process on another app is a fast way of testing the account. More information and options can be found here ( Apple Support).